22 March 2017: Datalex (ISE: DLE) a leading provider of digital commerce for travel retailers and JetBlue Technology Ventures, the wholly owned venture capital subsidiary of JetBlue Airways (NASDAQ: JBLU), today announce their partnership to assist in the incubation of early stage start-ups within the Silicon Valley-based venture firm’s portfolio. Dublin, Ireland – 01 February 2017: Datalex has become a member of the IATA Strategic Partnership Program, IATA’s supplier program that brings together industry expertise to shape the future of aviation through thought-leadership and innovation. Dublin, Ireland – 30 November 2016: Datalex, a market leader in digital commerce for travel retailers, today announces that Jonathan Sutter has been appointed as Vice President Sales, Americas. In this role, Jonathan will manage business opportunities throughout the Americas. 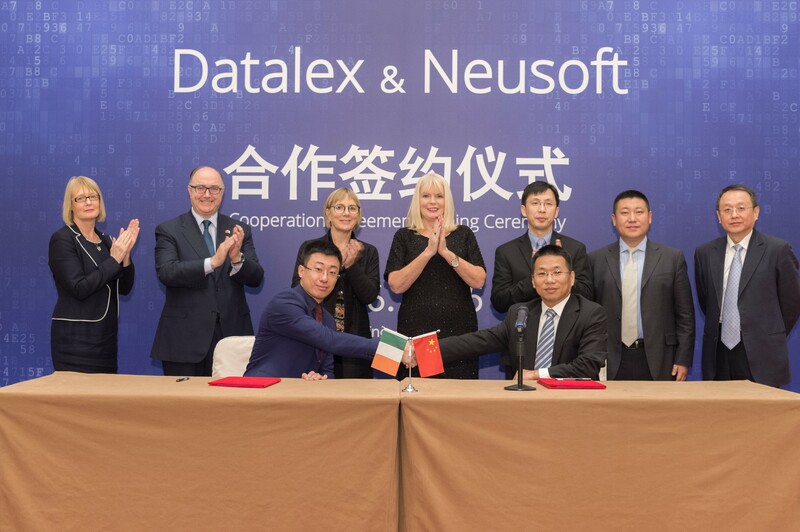 Haoran Guo, General Manager, Datalex China and Limin Wang, VP of Neusoft sign agreement in presence of Julie Sinnamon – CEO, Enterprise Ireland and Mary O’Connor – Minister for Department of Jobs, Enterprise, and Innovation.